Our writing PLD for this year is based on the underlying principal of student agency driving an improvement in student achievement. At the beginning of this development when Brian Annan was discussing the approach I was familiar with the term but not conversant nor had a deep understanding. So I needed to connect some of the dots and clarify what it was all about. Isn’t it funny too that when an idea is emphasised like student agency, that it seems to appear everywhere now that your awareness of it is heightened. e.g. Last month listening to Mark Osbourne at the L@S Roadshow, Personalising Learning in Future-Focused Schools where agency was a key theme. The Term 2 edition of School News, where Russell Burt discusses agency as part of an article named ReTooling School [a Maniakalani story]. In summary, sustained higher achievement is possible when teachers use pedagogical approaches that enable students to take charge of their own learning. Such approaches do not leave the students ‘to discover’ in an unstructured environment. Rather, they are highly structured in supporting student agency and sustained and thoughtful engagement. For example, they foster students’ abilities to define their own learning goals, ask questions, anticipate the structure of curriculum experiences, use metacognitive strategies when engaging with curriculum, and self-monitor. Pedagogies that emphasise, embed and enable metacognitive strategy-use throughout curriculum engagement for class groupings, are associated with much higher achievement and enable marked improvements for low achievers. Student agency is a cluster of academic mindsets and learning strategies that have been demonstrated to advance learning and achievement. Academic mindsets are more evident in students who feel a sense of belonging in a certain subject, class or school; believe that they have the capacity to learn, and see value in their participation. Learning strategies include study skills, meta-cognition and goal-setting, competencies that help individuals persist when learning becomes challenging. Student agency refers to empowering students through curriculum approaches that; engage them, are respectful of and seek their opinions, give them opportunities to feel connected to school life, promote positive and caring relationships between all members of the school community, promote wellbeing and focus on the whole student, relate to real-life experiences, are safe and supportive. These definitions illustrate to me that agency is about student learning and teacher teaching. It is about the teacher providing the right environment, support and approaches to learning that enable learners to develop the skills and attitudes for agency to occur, and about the student being engaged in, and empowered by assuming responsibility of their learning through reflection, goal setting and a range of other self-monitoring behaviours. Some of the key words that describe student agency for me are therefore; enabling, empowering, self-monitoring, goals, feedback, meta-cognition, active, responsive, self-directed and meaningful. What strikes me about this model though is that it does not take in the role of the teacher in to the equation (or maybe it does… I would need to read the full explanation from Entwistle himself). As I have stated above student agency isn’t just the responsibility of the student, the teacher and school must provide the conditions and support/model/teach in an way that provides all students with the ability to learn and demonstrate agency. So bringing it back to where this post started, with our writing PLD. Our facilitator Rita Plamer has introduced us to Ralph Fletcher’s work and she dug out this reference to agency from the text A Writer’s Notebook – Unlocking the Writer Within You. Being in control of their own development, i.e. their own learning – great! This surely is the core of what student agency is. Deliberate vs accidental… A few of you may be saying that this is what happens in your classroom all the time. Yes my students set goals, yes they are reflective. But how much of that agency is a deliberate approach i.e. If I looked at your planning and a see how you have deliberately structured your teaching to ensure the conditions and strategies are student agency productive? If student agency is a way of empowering our students, then teacher agency is just as important (through the principal leading and providing the support/conditions/opportunities) which makes principal agency equally as important (with the Board providing the support/conditions/opportunities). Is this being overly simplistic? Seems to make sense to me. One aspect that has surprised me was that there was little to no reference to student voice in the information read to date. I would have thought they go hand in hand. Most of the definitions/examples are about the individual learners, but like the excerpt above from Ralph Fletcher’s book, the social learning aspect is really important. Meaningful action could just as well be the outcome of collaboration and teamwork. If the action is a result of feedback, then that is a partnership in learning too, or does agency count when the thinking and action is done as an individual – not the process leading up to it? Much to ponder… and more reading required. One of my developmental goals for the year is to develop effective strategies for observing and feeding back to staff. My aim is that the resulting observations and feedback strategies contribute to growth in teacher effectiveness. Undertake professional readings related to goal. Explore possible approaches to undertaking classroom observation & providing feedback to staff. Seek regular feedback from staff as to the quality of observations/feedback. Visit other schools to observe and discuss observation/feedback systems. In my mind I already had a starting point or a vision for the initial approach. This revolved around the learning walk concept, more specifically Cheryl Doig’s Future Learning Walks thinking and framework combined with the integration of elearning tools to capture the evidence during the observation and forming the foundation of the reflection. Another link in the chain was the Taxonomy of Reflection described by Peter Pappas to provide the structure for the reflective discussion. The purpose of a future learning walk is to generate deep conversations about learning. It is an adaptive approach with the process co-constructed within the staff to meet the needs to the school. In practice it is a focused and regular walk through of classrooms/learning areas for a short period of time, with observations and data gathered, which is then discussed, reflected and projected on. Not just from a classroom teaching/learning level, the process can impact of school wide systems and organisation. A progressive framework, based on Bloom’s hierarchal taxonomy, for prompting reflection and discussion. It could be used very effectively after a walkthrough when either the observers and reflecting amongst themselves, or when the observee is reflecting on their own lesson/learning. 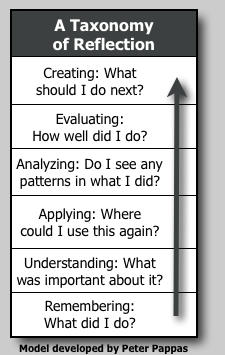 Flexible framework for prompting reflection. You don’t need to start at the bottom and work up, rather ask any questions that will develop deeper reflection – in response to what you are hearing. Can be used in a huge range of situations, well beyond a professional observer/observee relationship. Student-student, student-teacher, self-assessment etc. Coach/mentor can use the taxonomy to ensure coverage of a range of questions but most importantly, HOT questions and thinking. On the whole I was underwhelmed by all of these examples, which essentially turned the iPad into a digital clipboard, through using Google Forms or specific apps like Teachscape with a list of predifined criteria that was checked off during the walkthrough. My vision is a little different. I want to capture a digital narrative of the teaching and learning, enriched by multimedia, capturing authentic voice and examples. Future Learning Walks, as mentioned above, have an agreed upon focus which forms the basis for a observation/walkthrough. As part of our redevelopment of our school’s curriculum plan, we are currently unpacking and redefining what writing looks like at KHS. This involves clearly stating our shared beliefs of writing and the characteristics of an effective writing classroom. Once co-constructed and confirmed these will form the focus of a walkthrough during writing. While I like the Taxonomy of Reflection, I have been recently re-introduced to the Question Matrix, a framework for asking questions from basic recall to higher order similar to Bloom’s. I can see this as being an equally valuable framework to use for the same reasons as listed above, but perhaps more user friendly and a tool that is commonly used by students in their learning. The matrix layout means that you could also populate it to suit a particular focus or target.